Although Listeria monocytogenes can induce systemic infection causing spontaneous abortion, septicemia, and meningitis, studies have not been performed to investigate human anti-L. monocytogenes immune responses, including those of Ag-specific Vγ2Vδ2 T cells, a dominant human γδ T cell subset. L. monocytogenes is the only pathogen known to possess both the mevalonate and non-mevalonate isoprenoid biosynthesis pathways that produce metabolic phosphates or phosphoantigens activating human Vγ2Vδ2 T cells, making it interesting to explore in vivo anti-L. monocytogenes immune responses of Vγ2Vδ2 T cells. In this study, we demonstrated that subclinical systemic L. monocytogenes infection of rhesus macaques via parenteral inoculation or vaccination with an attenuated Listeria strain induced multieffector-functional immune responses of phosphoantigen-specific Vγ2Vδ2 T cells. Subclinical systemic infection and reinfection with attenuated L. monocytogenes uncovered the ability of Vγ2Vδ2 T cells to mount expansion and adaptive or recall-like expansion. Expanded Vγ2Vδ2 T cells could traffic to and accumulate in the pulmonary compartment and intestinal mucosa. Expanded Vγ2Vδ2 T cells could evolve into effector cells producing IFN-γ, TNF-α, IL-4, IL-17, or perforin after L. monocytogenes infection, and some effector Vγ2Vδ2 T cells could coproduce IL-17 and IFN-γ, IL-4 and IFN-γ, or TNF-α and perforin. Surprisingly, in vivo-expanded Vγ2Vδ2 T effector cells in subclinical L. monocytogenes infection could directly lyse L. monocytogenes-infected target cells and inhibit intracellular L. monocytogenes bacteria. Thus, we present the first demonstration, to our knowledge, of multieffector-functional Vγ2Vδ2 T cell responses against L. monocytogenes. Vγ2Vδ2 T cells exist only in primates, and in humans they comprise 65–90% of total circulating γδ T cells. Vγ2Vδ2 T cells can be activated by metabolites from isoprenoid synthesis, such as isopentenyl pyrophosphate (IPP) and (E)-4-hydroxy-3-methyl-but-2-enyl pyrophosphate (HMBPP) (1, 2), which are usually referred to as phosphoantigens. Isoprenoids are produced via two major pathways: the classical, mevalonate pathway, or the alternative, nonmevalonate pathway (2, 3). IPP is an intermediate metabolite found in both pathways, whereas HMBPP is only produced in the nonmevalonate pathway by some selected microbes including Mycobaterium tuberculosis and Listeria monocytogenes (2, 3). HMBPP is ∼1000-fold more potent than IPP for in vitro activation of Vγ2Vδ2 T cells (2), and studies from us and others suggest that Vγ2Vδ2 TCR recognizes HMBPP presented by APC (4, 5). In vitro-activated Vγ2Vδ2 T cells can produce IFN-γ and TNF-α (6–9) and lyse infected cells or tumor cells via perforin (7, 10–12). In vivo, Vγ2Vδ2 T cells can mount major expansion during Mycobacterium infections, and rapid recall-like expansion of these γδ T cells after M. tuberculosis challenge of bacillus Calmette-Guérin (BCG)-vaccinated macaques is associated with BCG-induced protection against fatal tuberculosis in juvenile rhesus macaques (6). Furthermore, major expansion of Vγ2Vδ2 T effector cells after HMBPP plus IL-2 post-challenge treatment can lead to homeostatic protection against severe pneumonic plague lesions after inhalational Yersinia pestis infection of macaques (13). However, a role of Vγ2Vδ2 T cells in immunity to intracellular bacterial pathogens remains to be determined, and the definition requires in-depth studies of these HMBPP-specific Vγ2Vδ2 T cells in infections. Listeria monocytogenes, a Gram-positive, intracellular bacterium, is the only pathogen known to possess both the mevalonate and nonmevalonate pathways of isoprenoid biosynthesis (3), making it an ideal candidate to study in vivo responses of Vγ2Vδ2 T cells and anti-L. monocytogenes effector function. Although L. monocytogenes bacteria can induce systemic infection causing spontaneous abortion, septicemia, and meningitis, anti-L. monocytogenes immunity in humans has not been defined. In murine models of systemic L. monocytogenes infection, mice deficient in neutrophils exhibit increased bacterial burden during early L. monocytogenes infection (14–16). In addition, murine IFN-γ, IL-23, IL-17, and CD8+ T cells have been shown to play a role in protection against L. monocytogenes infection (17–21). Ag-specific γδ T cell responses to L. monocytogenes infection has not been reported (22–25), and in vivo studies of Vγ2Vδ2 T cells for anti-L. monocytogenes immunity cannot be appropriately performed in mice or other laboratory animals as γδ T cells in these laboratory animals do not recognize HMBPP or other microbial Ags. Thus, nonhuman primate models appear to provide a unique model system in which to explore immune responses and effector function of HMBPP-specific Vγ2Vδ2 T cells during L. monocytogenes infection. In the current study, rhesus macaques were infected systemically with an attenuated L. monocytogenes strain (Listeria ΔactA prfA*), which carries a deletion of the actA gene and a mutation of the constitutively active prfA gene (26, 27). The actA deletion abrogates the ability of L. monocytogenes to polymerize actin and to mediate cell-to-cell spread of L. monocytogenes, although the prfA mutation upregulates L. monocytogenes gene expression (26). The subclinical systemic Listeria ΔactA prfA* infection in macaques allowed us optimally to demonstrate multieffector-functional immune responses of Vγ2Vδ2 T cells. L. monocytogenes-activated Vγ2Vδ2 T cells could mount adaptive or recall-like expansion, traffic to or accumulate in intestinal mucosa/airways, produce multiple cytokines, and coproduce IL-17 and IFN-γ, IL-4 and IFN-γ, or TNF-α and perforin. The in vivo-expanded Vγ2Vδ2 T cells can directly lyse L. monocytogenes-infected target cells and inhibit intracellular L. monocytogenes bacteria without the need for prior in vitro phosphoantigen stimulation. Nine Chinese-origin rhesus macaques, ages 5–11, were used in this study. All animals were housed and used in accordance with the guidelines of the institutional animal care and use committee. Two macaques were infected at day 0 with 108 CFU attenuated Listeria ΔactA prfA* (26) i.m. and boosted on day 35 with 108 CFU i.v. Seven macaques were infected at day 0 with 106 CFU i.v. and boosted on week 7 with 108 CFU i.v. Day 0 blood was drawn immediately before infection. Rectal biopsies and bronchoalveolar lavage (BAL) fluid were collected as previously described (7). Briefly, for rectal biopsies, animals were restrained in ventral recumbency with the pelvis elevated 4–5 in. Four or five pellets were collected using 2 × 3mm forceps. For BAL fluid collection, a pediatric feeding tube was inserted down into the trachea through direct visualization with a laryngoscope and further into the right or left bronchus at the level of the carina. Ten milliliters of saline were instilled into the bronchus and immediately withdrawn and repeated a maximum of three times until a total of 12–15 ml BAL fluid was retrieved. This procedure generally gave rise to fluid compositions and volumes that were comparable to the bronchoscope-guided BAL (data not shown). Animals were anesthetized with 10 mg/kg ketamine HCL (Fort Dodge Animal Health) prior to all procedures. The attenuated L. monocytogenes strain Listeria ΔactA prfA* (26) was obtained from Nancy Freitag (University of Illinois at Chicago) as previously described (26). Attenuated bacteria were stored in aliquots at −80°C in 20% glycerol (Fisher Chemical, Fairlawn, NJ), Bacteria were thawed, washed two times with brain heart infusion broth (BD Bioscience, Franklin Lakes, NJ), and resuspended in 1 ml sterile PBS (Life Technologies, Invitrogen, Carlsbad, CA) for injection. PBLs were isolated from freshly collected EDTA blood by Ficoll-Paque Plus (Amersham, Piscataway, NJ) density gradient centrifugation before analysis. Lymphocytes from BAL fluid and rectal mucosae were isolated as previously described (7). Cell staining was performed as previously described (28). For cell-surface staining, PBLs were stained with up to five Abs (conjugated to FITC, PE, allophycocyanin, Pacific blue, and PE–Cy7) for 15 min. After staining, cells were fixed with 2% formaldehyde–PBS prior to analysis on a CyAn ADP flow cytometer (DakoCytomation, Carpinteria, CA). Lymphocytes were gated based on forward and side scatters, and pulse width and at least 40,000 gated events were generally analyzed using Summit Data Acquisition and Analysis Software (DakoCytomation). The following mouse Abs were used: IL-17 (eBio64CAP17) (eBioscience, San Diego, CA), streptavidin–Pacific blue (Invitrogen), Vγ9 (7A5), Vδ2 (15D) (Pierce), goat anti-mouse IgG (H+L)PE (Beckman Coulter, Brea, CA), CD3 (SP34-2), IFN-γ (4S.B3), and IL-4 (8D4-8) (BD Pharmingen, San Diego, CA). Intracellular cytokine staining (ICS) was performed as previously described (28). Briefly, 0.5 × 106 PBLs plus mAbs CD28 (1 μg/ml) and CD49d (1 μg/ml) were incubated with or without 50 ng/ml HMBPP in 100 μl final volume for 1 h at 37°C, 5% CO2 followed by an additional 5-h incubation in the presence of brefeldin A (GolgiPlug; BD Bioscience). After staining for cell surface markers (CD3, Vγ2) for 15 min, cells were permeabilized for 45 min (Cytofix/Cytoperm; BD) and stained 45 min for IFN-γ, IL-4, and IL-17 before fixation in formalin. Because cytokine-producing Vγ2Vδ2 T effector cells were measured exactly in the same way prospectively at time points of preinfection and postinfection, absolute numbers of these effector cells were accordingly compared over time postinfection. PBMCs were incubated 3 h at 37°C in a 10-ml flask. Nonadherent PBMCs (lymphocytes) were separated from adherent cells (monocytes). Adherent cells were released from the flask using ice-cold PBS (Life Technologies), then incubated with 50 ng/ml GM-CSF (Sigma, St. Louis, MO) and 20 ng/ml IL-4 (Sigma) for 3 d at 37°C to differentiate into dendritic cells (DCs). DCs were then infected for 90 min with attenuated L. monocytogenes at a multiplicity of infection of 50. The cells were treated with 30 μg/ml gentamicin sulfate (Life Technologies) 2 h later to kill noninternalized bacteria, then incubated an additional 2 d. Nonadherent PBMCs were used to isolate Vγ2+ cells and CD20+ B cells (clone 2H7; eBioscience) using MACS (Miltenyi Biotech, Auburn, CA). Autologous effector and target cells were incubated in triplicate at a ratio of 5:1 for 14–16 h in 96-well plates, then harvested and stained with CD11c (clone 3.9; BioLegend, San Diego, CA) and propidium iodide (PI; Invitrogen) and analyzed for PI-stained dead cells. This was done following the standard protocol as we and others previously described (29, 30). To generate L. monocytogenes-infected targets, monocytes isolated from PBMCs were cultured for 3–4 d to generate monolayer macrophages. Monocyte-derived macrophages were incubated for 90 min in the presence of L. monocytogenes bacteria (multiplicity of infection = 100), then incubated in RPMI 1640 media containing 10% FBS supplemented with gentamicin for 1 h to kill all extracellular bacteria and subsequently washed twice with RPMI with 10% FBS. Target cells (104) were cocultured with 105 purified autologous effector Vγ2+ T cells or control CD20+ B cells in each well (performed in triplicate) of a 96-well plate. After overnight coculture, plates were centrifuged to pellet cells, supernatant was removed, and cells were incubated in 200 μl sterile water to lyse target cells and release L. monocytogenes bacteria from infected cells. Ten-fold serial dilutions of lysate were made in sterile water and plated on BHI plates containing streptomycin to select for L. monocytogenes bacteria (30). Statistical analysis was performed using paired two-tailed Student t test or nonparametric test (6) using GraphPad Prism software (GraphPad, La Jolla, CA). Whereas it is well known that L. monocytogenes bacteria can produce large amounts of HMBPP activating Vγ2Vδ2 T cells in vitro, it remains unknown whether active L. monocytogenes infection of humans could induce expansion or recall expansion of HMBPP-specific Vγ2Vδ2 T cells. As a proof-of-concept study, two groups of nine rhesus macaques were infected and reinfected systemically with attenuated Listeria ΔactA prfA* (26), respectively. The justification or rationale for inoculating macaques with attenuated Listeria ΔactA prfA* by a systemic route was to induce subclinical systemic L. monocytogenes infection that mimics bacteremia or dissemination of Listeria infection in humans. Oral Listeria infection does not consistently induce a high rate of systemic Listeria infection in immune-competent humans and macaques. Our systemic infection model would allow us to prove an immunology concept, rather than disease pathogenesis, and optimally to examine in vivo immune responses of Vγ2Vδ2 T cells during systemic infection. Although systemic inoculation with wild-type Listeria would similarly stimulate macaque γδ T cells, such virulent systemic infection might lead to rapid death, leaving little or no time optimally to study Vγ2Vδ2 T cells. In fact, systemic infection of mice with L. monocytogenes was also used to study αβ T cell immune responses (21). We presumed that subclinical systemic Listeria ΔactA prfA* infection in macaques would induce Vγ2Vδ2 T cell responses that are somehow relevant to those in human systemic listeriosis or septicemia after L. monocytogenes infection (25, 31, 32). The first group of two macaques was inoculated i.m. with 108 CFU Listeria ΔactA prfA* at day 0 and, at day 35, inoculated again i.v. with 108 CFU Listeria ΔactA prfA*. The first L. monocytogenes inoculation induced detectable increases in percentage and absolute numbers of Vγ2Vδ2 T cells; the secondary inoculation or immunization led to 5- to 10-fold greater expansion of Vγ2Vδ2 T cells that was sustained for at least 3–4 wk (Fig. 1A–C). This initial finding suggested that subclinical systemic L. monocytogenes infection could induce an adaptive or recall-like response of Vγ2Vδ2 T cells. Given the possibility that initial low-dose infection could drive optimal recall-like responses of Vγ2Vδ2 T cells in subsequent microbial exposure (8), we infected the second group of seven macaques by inoculating 106 CFU Listeria ΔactA prfA* i.v. at day 0 and 108 CFU i.v. at day 49, respectively. Notably, the second group of macaques exhibited much greater recall-like expansion of Vγ2Vδ2 T cells after the second exposure to Listeria ΔactA prfA*, although the primary exposure to the L. monocytogenes elicited low-level increases in these γδ T cells (Fig.1A–C). 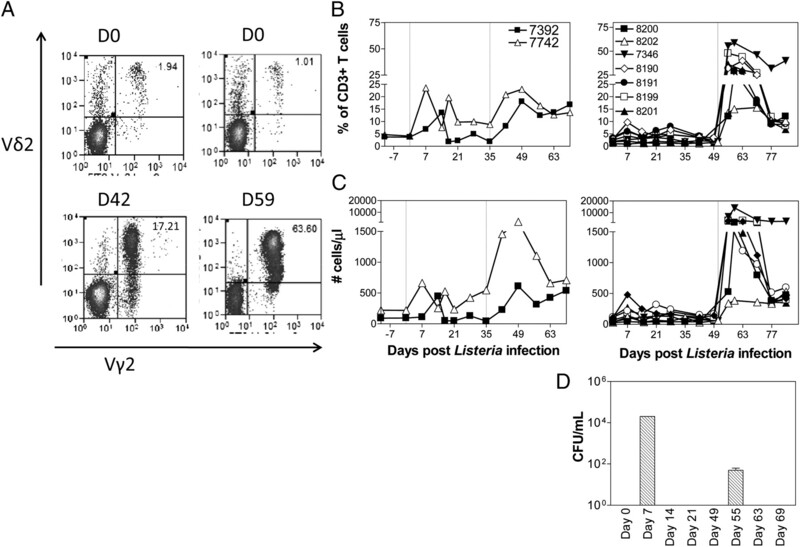 One week after the second exposure to Listeria ΔactA prfA*, Vγ2Vδ2 T cells proliferated and expanded from <2% baseline up to 63% of total CD3+ T cells, or absolute numbers from <50 cells/μl up to ∼13,000 cells/μl of blood (Fig. 1A–C). Transient systemic L. monocytogenes infections uncovered the ability of HMBPP-specific Vγ2Vδ2 T cells to mount adaptive or recall-like immune responses. (A) Representative histograms showing Vγ2Vδ2 T cells in PBMCs on day 0 (top) and at the peak of Vγ2Vδ2 T cell expansion during subclinical systemic L. monocytogenes infection. Data are gated on CD3+ lymphocytes. (B) Vγ2Vδ2 T cells, expressed as percent of CD3+ T cells, demonstrated expansion and recall-like expansion after primary and secondary L. monocytogenes infections, respectively, in group 1 (left) and in group 2 (right). Two vertical dotted lines denote the time points for the first and second L. monocytogenes inoculations, respectively. (C) Increases in absolute numbers of Vγ2Vδ2 T cells after primary and secondary L. monocytogenes infections. p < 0.0001 for comparisons between day 0 and day 56 or between day 0 and days 59/63. (D) Expansion and recall-like expansion of Vγ2Vδ2 T cells were associated with subsequent transient L. monocytogenes bacteremia. Shown are L. monocytogenes CFU counts in the blood of rhesus macaques after initial L. monocytogenes infection (day 0) or L. monocytogenes reinfection (day 49) by i.v. route (n = 4). D, Day. Initial expansion and recall-like expansion of Vγ2Vδ2 T cells were driven by Listeria ΔactA prfA* bacterial burdens as L. monocytogenes bacteria were isolated from the blood of the macaques at 1 wk after initial and secondary inoculations with Listeria ΔactA prfA*, respectively (Fig. 1D). Notably, despite a reduced level of L. monocytogenes bacteremia after the L. monocytogenes reinfection, Vγ2Vδ2 T cells mounted remarkable recall-like expansion, suggesting that host factors help to adapt recall-like immune response (Fig. 1D). Notably, initial expansion and recall-like expansion of Vγ2Vδ2 T cells were associated with the subsequent resolutions of L. monocytogenes bacteremia each time after i.v. L. monocytogenes inoculation (Fig. 1). Thus, transient subclinical systemic infections with L. monocytogenes could uncover the ability of HMBPP-specific Vγ2Vδ2 T cells to mount adaptive or recall-like immune responses. In the setting of Listeria dissemination, bacteremia/septicemia and local mucosal infection likely coexist. We therefore sought to determine if Vγ2Vδ2 T cells activated by subclinical systemic L. monocytogenes infections were able to traffic to mucosa/tissue sites for potential mucosal immunity (7). For simplicity in testing the trafficking function of Vγ2Vδ2 T cells, we compared Vγ2Vδ2 T cells between the rectal and bronchoalveolar interfaces. Consistent with major expansion of Vγ2Vδ2 T cells in the blood, up to10-fold increases in numbers of Vγ2Vδ2 T cells were detected in BAL fluid after both the primary and secondary inoculations with L. monocytogenes in both groups compared with controls (p = 0.0067 for baseline versus 2 wk after primary infection; p = 0.0024 for baseline versus 1–2 wk after secondary infection; Fig. 2). In particular, greater increases in Vγ2Vδ2 T cells in BAL fluid from the group 2 macaques were seen after the secondary L. monocytogenes inoculation (Fig. 2). These results implicated that Vγ2Vδ2 T cells underwent airway trafficking after cellular expansion during L. monocytogenes infections. To examine if Vγ2Vδ2 T cells could traffic to intestinal mucosae, we performed rectal mucosal biopsy to isolate lymphocytes from the biopsies and analyzed percentage numbers of Vγ2Vδ2 T cells in total mucosal T cells as we previously did (28). Similarly, we found ∼10-fold increases in numbers of Vγ2Vδ2 T cells in the rectal mucosae after primary and secondary Listeria ΔactA prfA* infections in comparison with controls (p = 0.0288, baseline versus 1–2 wk after secondary infection; Fig. 2D). These results therefore demonstrated that expanded Vγ2Vδ2 T cells during primary and secondary Listeria ΔactA prfA* infections could traffic to and accumulate in the pulmonary compartment and intestinal mucosa. Expanded Vγ2Vδ2 T cells could traffic to and accumulate in the pulmonary compartment and rectal mucosa during Listeria ΔactA prfA* infections. (A) Representative histograms showing accumulation of Vγ2Vδ2 T cells in BAL cells on day 0 (top) and day 65 (bottom). Gated on CD3+ lymphocytes. (B and C) Bar graphs indicate increases in numbers of Vγ2Vδ2 T cells in BAL lymphocytes in groups 1 (left) and 2 (right) of macaques after L. monocytogenes infection. p < 0.01 for postinfection levels at days 15/17 and days 44/65, respectively, compared with levels from naive controls. (D and E) Bar graphs indicate increases in numbers of Vγ2Vδ2 T cells in rectal mucosal lymphocytes in groups 1 (left) and 2 (right) of macaques after L. monocytogenes infection. p < 0.05 for postinfection levels at days 15/17 and days 44/65, respectively, compared with levels from naive controls (n = 5 for each group). Naive controls in (B) are also used for statistical analysis in (C). Naive controls in (D) are also used for statistical analysis in (E). D, Day. We next assessed Vγ2Vδ2 T cells for effector functions producing anti-microbial cytokines over time during primary and secondary Listeria ΔactA prfA* infections using mAbs against IFN-γ, TNF-α, IL-17/IL-22, IL-4, and perforin for ICS. Whereas Listeria ΔactA prfA* infections induced very few Vγ2Vδ2 T cells producing IL-22 (data not shown), there were appreciable numbers of Vγ2Vδ2 T effector cells ex vivo producing IFN-γ, TNF-α, IL-4, IL-17, or perforin after secondary L. monocytogenes infection (Figs. 3, 4). In particular, mean absolute numbers of Vγ2Vδ2 T cells producing IFN-γ or IL-4 ex vivo increased up to 1000-fold and 20-fold, respectively, after the second L. monocytogenes exposure (Fig. 4; p = 0.0291 for IFN-γ, p = 0.0096 for IL-4 in comparison between days 59–63 and day 0 or day 42). Vγ2Vδ2 T cells producing IL-17 or perforin increased from baseline <10 cells/μl up to 350 cells/μl and 400 cells/μl of blood, respectively, after the second L. monocytogenes infection (Fig. 4; p = 0.0096 for IL-17, and p = 0.0206 for perforin). Vγ2Vδ2 T cells producing TNF-α increased up to 2000 cells/μl at days 59–63 (Fig. 4, p = 0.0043 in comparisons with day 42 or day 0). These results suggested that expanded Vγ2Vδ2 T cells could evolve into the effector cells producing IFN-γ, TNF-α, IL-4, IL-17, or perforin after L. monocytogenes exposures. Representative flow histograms showing production and coproduction of various cytokines by Vγ2Vδ2 T cells. (A) Representative histograms show that Vγ2Vδ2 T cells produce IFN-γ, IL-4, and IL-17 after ex vivo HMBPP stimulation. (B) Production of TNF-α and perforin by Vγ2Vδ2 T cells after HMBPP stimulation. D, Day. Vγ2Vδ2 T cells evolved into multieffector functions producing various cytokines after Listeria ΔactA prfA* infection. (A) Increases in absolute numbers of effector Vγ2Vδ2 T cells producing IFN-γ in group 1 (left) and group 2 (right) of macaques after primary L. monocytogenes infection and L. monocytogenes reinfection. p = 0.0291 in comparison between days 59/63 and day 0 or day 42. p = 0.0096 for IL-4 in comparison between days 59–63 and day 0 or day 42. (B) Increases in absolute numbers of effector Vγ2Vδ2 T cells producing IL-4 after L. monocytogenes infection. p = 0.0096 in comparison between days 59/63 and day 0 or day 42. (C) Increases in absolute numbers of effector Vγ2Vδ2 T cells producing IL-17 after L. monocytogenes infection. p = 0.0096 in comparison between days 59/63 and day 0 or day 42. (D) Increases in absolute numbers of Vγ2Vδ2 T cells producing perforin after L. monocytogenes infection. p = 0.0206 in comparison between days 59/63 and day 0 or day 42. (E) Increases in absolute numbers of Vγ2Vδ2 T cells producing TNF-α after L. monocytogenes infection. p = 0.0043 in comparison between days 59/63 and day 0 or day 42. Although effector CD4+ T cells appear to have immune plasticity or flexibility producing or coproducing different cytokines (33), it is unknown whether in vivo-expanded Vγ2Vδ2 T cells can coproduce different cytokines de novo at some points during infections (7–9, 34, 35). As an initial study to explore this, we assessed Vγ2Vδ2 T cells for effector functions coproducing multiple cytokines that have different roles in anti-microbial responses over time after subclinical systemic L. monocytogenes infection. Notably, some Vγ2Vδ2 T cells were able simultaneously to coproduce IL-17 and IFN-γ, IL-4 and IFN-γ, or TNF-α and perforin during subclinical systemic L. monocytogenes infection (Figs. 3, 5). At 1–2 wk after re-exposure to L. monocytogenes, there were significant increases in numbers of Vγ2Vδ2 T cells coproducing IFN-γ and IL-4 (p = 0.0026) or IFN-γ and IL-17 (p = 0.0099) in response to in vitro HMBPP stimulation (Figs. 3, 5). Vγ2Vδ2 T cells capable of in vitro coproducing TNF-α and perforin also increased significantly (p = 0.0017) after the second exposure to L. monocytogenes (Fig. 5). Listeria ΔactA prfA* infection induced multieffector Vγ2Vδ2 T cells coproducing different cytokines in the presence (right) or absence (left) of HMBPP stimulation. (A) Increases in absolute numbers of Vγ2Vδ2 T cells coproducing IL-4 and IFN-γ after L. monocytogenes infection. p < 0.01 for the setting with (right) or without (left) the need for HMBPP stimulation (see the table at the bottom of the figure). (B) Increases in absolute numbers of Vγ2Vδ2 T cells coproducing IL-17 and IFN-γ after L. monocytogenes infection. p < 0.01 for the setting with (right) or without (left) the need for HMBPP stimulation (see the table at the bottom of the figure). (C) Increases in absolute numbers of Vγ2Vδ2 T cells coproducing perforin and TNF-α after L. monocytogenes infection. p < 0.01 for the setting with (right) or without (left) the need for HMBPP stimulation (see the table at the bottom of the figure). D, Day. We then examined if these cytokine coproducers were also detected in the setting without in vitro phosphoantigen HMBPP stimulation. Our recent studies demonstrated that the direct ICS assay without in vitro Ag stimulation was useful for direct detection of effector T cells producing cytokines IFN-γ, IL-17/IL-22, TNF-α, or perforin de novo, as the direct ICS analysis could readily detect those evolving effector T cells over time during M. tuberculosis or malaria infection of macaques, but not during longitudinal follow-up of control uninfected individuals (36, 37). The direct ICS analysis showed that at 1–2 wk after re-exposure to L. monocytogenes, there were significant increases in effector Vγ2Vδ2 T cells that could coproduce IL-17 and IFN-γ, IL-4 and IFN-γ, or TNF-α and perforin de novo without the need for in vitro HMBPP stimulation (Fig. 5, p < 0.01 for all three sets of coproducers). Thus, some Vγ2Vδ2 T cells could exhibit multiple effector functions coproducing IFN-γ/IL-4, IFN-γ/IL-17, or TNF-α/perforin during subclinical systemic L. monocytogenes infection. To our knowledge, this is the first demonstration of multieffector-functional responses of Vγ2Vδ2 T cells during microbial infection of macaques. Emergence of Vγ2Vδ2 T cells producing perforin and other cytokines de novo raised a question as to whether these in vivo-expanded γδ T effector cells were able directly to lyse L. monocytogenes-infected target cells and inhibit intracellular L. monocytogenes bacteria. To test Vγ2Vδ2 T cell-mediated lysis of L. monocytogenes-infected target cells, we used a cytotoxicity assay testing the ability of Vγ2Vδ2 T cells directly to lyse L. monocytogenes-infected autologous target cells without in vitro stimulation of these γδ T cells. Because Listeria ΔactA prfA* infections exclusively expanded Vγ2Vδ2 T cells but not other γδ T subsets in blood, we purified in vivo-expanded Vγ2Vδ2 T cells directly from PBMCs after the infection using anti-Vγ2 mAb and immunobeads (MACS) as previously described (38). Purified Vγ2Vδ2 T cells were then cocultured with L. monocytogenes-infected autologous monocyte-derived DCs and assessed for CTL killing of DCs. Vγ2Vδ2 T cells that subtly expanded at day 15 after L. monocytogenes infection (Fig. 1) did not mediate apparent CTL killing of L. monocytogenes-infected DCs (Fig. 6A). In contrast, Vγ2Vδ2 T cells purified at day 59, the peak expansion time, could efficiently lyse L. monocytogenes-infected DCs (Fig. 6A). Virtually, these Vγ2Vδ2 T cells isolated at peak expansion were able to lyse almost 50% of L. monocytogenes-infected DCs after subtracting the values of various controls (Fig. 6A, 6B). This potent CTL lysis of L. monocytogenes-infected DCs appeared to be consistent with the remarkable increases in numbers of Vγ2Vδ2 T effector cells producing perforin de novo at 1–2 wk after re-exposure to L. monocytogenes (Figs. 4D, 5). In vivo-expanded Vγ2Vδ2 T effector cells after L. monocytogenes reinfection could directly lyse L. monocytogenes-infected target cells and limit intracellular L. monocytogenes bacteria growth. (A) Representative histograms for flow-based cytotoxicity assay show that Vγ2Vδ2 T effector cells that expanded in vivo after L. monocytogenes reinfection exhibited an increased lysis of L. monocytogenes-infected DCs. Data are gated on CD11c+ DC. 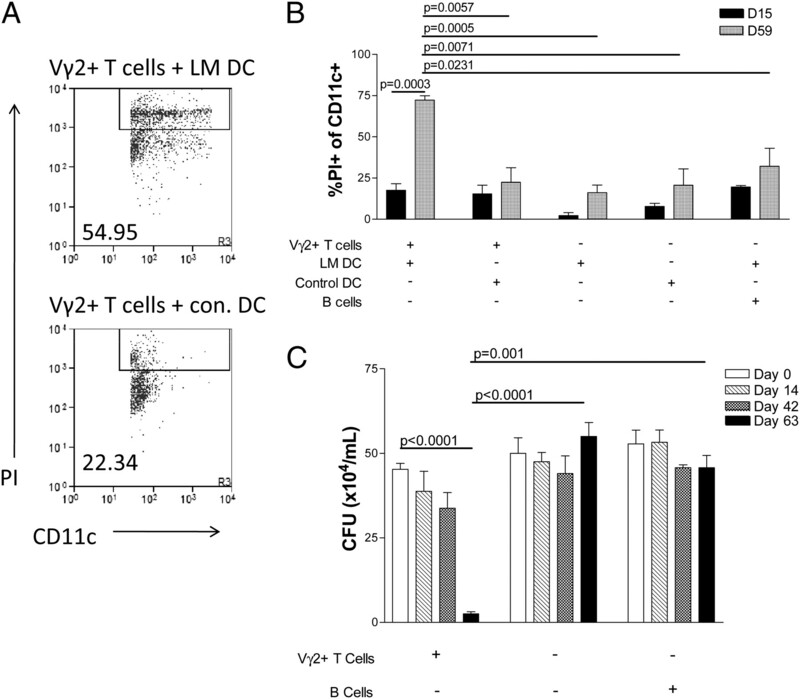 (B) Bar graphs demonstrated that effector Vγ2Vδ2 T cells that expanded in vivo after L. monocytogenes reinfection exhibited an increased lysis of L. monocytogenes-infected DCs. n = 5. Cell lysis is expressed as percentage number of PI-stained dead cells (“%PI+”) in CD11c+ DCs. Day 59 Vγ2Vδ2 T cells lysed more L. monocytogenes-infected DCs than did day 15 Vγ2Vδ2 T cells (p = 0.0003) and B cells (p = 0.0231), respectively. Day 59 Vγ2Vδ2 T cells lysed more L. monocytogenes-infected DCs than did control DCs (p = 0.0057), more than did the culture with L. monocytogenes-infected DCs only (p = 0.0005), and more than did the culture with control DCs only (p = 0.0071). (C) In vivo-expanded Vγ2Vδ2 T cells after L. monocytogenes reinfection could limit intracellular L. monocytogenes bacterial growth in monocyte-derived macrophages. n = 4. p < 0.0001 compared with baseline; p = 0.001 compared with B cells. D, Day; LM, L. monocytogenes. To determine if in vivo-expanded Vγ2Vδ2 T cells could inhibit intracellular L. monocytogenes bacteria in the infected cells, we measured CFU counts in lysate derived from L. monocytogenes-infected macrophages cocultured with purified Vγ2Vδ2 T cells. Notably, in vivo-expanded Vγ2Vδ2 T cells purified at day 63 were able to inhibit intracellular L. monocytogenes bacteria more efficiently than those isolated at day 0 (p < 0.0001) when they were cocultured with L. monocytogenes-infected macrophages (Fig. 6C). The reduction of L. monocytogenes CFU counts by day 63 Vγ2Vδ2 T cells was significantly more striking than that by the controls, B cells plus L. monocytogenes-infected macrophages (p < 0.001), or L. monocytogenes-infected macrophages only (p < 0.0001). Thus, in vivo-expanded Vγ2Vδ2 T cells after Listeria ΔactA prfA* infection could directly lyse L. monocytogenes-infected target cells and inhibit intracellular L. monocytogenes bacteria. We present the first in vivo study, to our knowledge, to examine L. monocytogenes-induced immune responses of HMBPP-specific Vγ2Vδ2 T cells during primary and secondary subclinical L. monocytogenes infections (3). Subclinical systemic L. monocytogenes infection of primates provides an interesting setting for studies of in vivo HMBPP-specific Vγ2Vδ2 T cells in that L. monocytogenes is the only pathogenic bacterium known to contain both mevalonate and nonmevalonate pathways of isoprenoid biosynthesis, concurrently producing metabolites such as HMBPP and IPP (3). Our findings in L. monocytogenes-infected macaques appear to be novel, as L. monocytogenes bacterial infections induce multieffector-functional immune responses of HMBPP-specific Vγ2Vδ2 T cells. The multieffector-functional immune responses of Vγ2Vδ2 T cells are characterized by the remarkable recall-like expansion, pulmonary or mucosal trafficking, broad effector functions producing or coproducing Th1 and Th2 or Th17 cytokines, direct lysis of L. monocytogenes-infected target cells, and inhibition of intracellular L. monocytogenes bacteria. To our knowledge, our work represents one of the significant immunological studies that elucidate broad anti-microbial effector functions of HMBPP-specific Vγ2Vδ2 T cells in vaccination or subclinical infection. One of the interesting immune features for Vγ2Vδ2 T cells during subclinical systemic L. monocytogenes infections is their ability to mount remarkable recall-like expansion. Clearly, absolute numbers of Vγ2Vδ2 T cells can increase from <50 cells/μl up to 15,000 cells/μl within a week after secondary L. monocytogenes inoculation. This extraordinary recall-like expansion is consistent with the adaptive immune response seen in macaques reinfected with Mycobacterium bovis BCG or those animals infected with M. bovis BCG and then reinfected by M. tuberculosis (6). These three bacterial pathogens share a common ability to produce HMBPP and to infect monocytes/macrophages/DCs intracellularly. However, in both BCG reinfection and Listeria reinfection, bacteria isolated from the blood are much lower than the bacteremia during primary infections, but the lower bacterial burdens induce much faster, greater, and longer expansion of Vγ2Vδ2 T cells, suggesting that host factors also play a role in mounting remarkable recall-like expansion. Our results are also consistent with the scenario that primary infection with HMBPP-producing microbes could optimally prime Vγ2Vδ2 T cells and such primed γδ T cells could mount remarkable recall-like expansion in response to subsequent reinfection. Data from human studies (39–45) also support the notion that human Vγ2Vδ2 T cells can mount adaptive or recall-like immune response in infections. Furthermore, our findings suggest that in vivo Vγ2Vδ2 T cell responses to intracellular infectious agents may be different from the rapid Vγ2Vδ2 T cell expansion after repeated phosphoantigen/IL-2 cotreatments (7, 34). Subclinical systemic L. monocytogenes infections also uncover pulmonary or intestinal mucosal migration characteristics of HMBPP-specific Vγ2Vδ2 T cells. This functional aspect is generally considered important for mucosal/pulmonary immunity as most microbial pathogens invade hosts at the mucosal interface. Vγ2Vδ2 T cells appear to emerge as a dominant T cell subpopulation among the T cell pool in airway and rectal mucosa after Listeria infections, as they compose up to 30% of total CD3+ T cells in those mucosae (Fig. 2). Given the possibility that lymphoid tissues in small intestines are more enriched than in rectal mucosa, we anticipate that Vγ2Vδ2 T cells may more apparently traffic to and accumulate in the small intestinal mucosae. The trafficking and accumulation of Vγ2Vδ2 T cells in intestinal mucosae might underscore the importance of these cells for contributing to mucosal immunity against food-borne L. monocytogenes infection. We previously demonstrated that expanded Vγ2Vδ2 T cells during BCG or M. tuberculosis infections or after HMBPP/IL-2 treatments could similarly undergo pulmonary/mucosal trafficking and accumulation (6, 7, 13, 46). Thus, pulmonary and intestinal mucosal trafficking/accumulations appear to be a common biological feature for activated Vγ2Vδ2 T cells regardless of the in vivo stimuli. Whereas a number of studies are focused on innate production of cytokines by Vγ2Vδ2 T cells (4, 7, 34), the current longitudinal follow-up studies reveal broad effector functions producing or coproducing cytokines by Vγ2Vδ2 T cells during adaptive or recall-like immune response in L. monocytogenes infections. L. monocytogenes-expanded Vγ2Vδ2 T cells are able to produce IFN-γ, TNF-α, IL-4, IL-17, and perforin, and some of them can simultaneously coproduce IL-17 and IFN-γ, IL-4 and IFN-γ, or TNF-α and perforin at peak expansion time after L. monocytogenes reinfection. It is noteworthy that such coproduction of cytokines can even be detected by direct ICS without prior in vitro HMBPP stimulation, which is close to an in vivo effector function for spontaneous cytokine production. Simultaneous coproduction of these cytokines by Th cells appears to be an uncommon, but not impossible, immune event as the development for each of the Th subsets producing Th1, Th2, and Th17 cytokines is controlled tightly by individual unique master transcriptional factors such as T-bet, GATA-3, and RORγT (33). Recent studies of αβ T cells have shown that IFN-γ can regulate production of IL-17 (47), and IFN-γ and IL-4 may be coproduced in some instances (48). During L. monocytogenes infection, production or coproduction of Th1, Th2, and Th17 cytokines by Vγ2Vδ2 T effector cells may play a role in activation of a variety of other immune cells such as DCs/macrophages, CD4+/CD8+ T cells, and B cells and therefore may bridge innate and adaptive immunity. In addition, IFN-γ and IL-17A can contribute to immunity to Listeria infection (20, 49), and perforin is protective against L. monocytogenes infection in mice (50). Another novel finding from the current study is the demonstration of direct lysis of Listeria-infected target cells by in vivo-expanded Vγ2Vδ2 T cells without in vitro HMBPP stimulation. Early studies showed that extensive in vitro activation/stimulation of Vγ2Vδ2 T cells by phosphoantigen/pathogen and IL-2 allows the cultured Vγ2Vδ2 T cells to lyse Mycobacterium-infected cells or inhibit intracellular mycobacteria (11, 12, 51). In the current study, we demonstrate that in vivo-expanded Vγ2Vδ2 T cells after systemic re-exposure to L. monocytogenes can directly lyse L. monocytogenes-infected CD11c+ DCs without the need for in vitro Ag/cytokine activation. This novel finding appears to be linked to the perforin-producing effector function of Vγ2Vδ2 T cells, as in vivo-expanded Vγ2Vδ2 T cells increase after the second infection and produce perforin de novo even without the need for in vitro HMBPP stimulation. The direct lysis might also be explained by the fact that most Vγ2Vδ2 T cells after the second infection express effector phenotype (data not shown). Importantly, these in vivo-expanded Vγ2Vδ2 T cells can inhibit intracellular L. monocytogenes bacterial replication. To our knowledge, this is the first experimental evidence showing direct lysis of microbe-infected cells and inhibition of intracellular L. monocytogenes by in vivo-expanded Vγ2Vδ2 T cells without the prior in vitro Ag stimulation. Thus, we have demonstrated multieffector functions of HMBPP-specific Vγ2Vδ2 T cells in immune responses to systemic exposures to L. monocytogenes. Results from comprehensive analyses of HMBPP-specific Vγ2Vδ2 T cells in the current study now provide a rationale to conduct comparative studies in the future using mutants of L. monocytogenes that fail to produce HMBPP. Our findings in the current study also raise the possibility to conduct further in vivo studies and investigate the role of Vγ2Vδ2 T cells in controlling L. monocytogenes infection. We thank Dr. Lisa Halliday for animal work assistance and other members at the Chen Lab for technical assistance. This work was supported by National Institutes of Health R01 Grants HL64560 (to Z.W.C.) and RR13601 (to Z.W.C.).
. 1994. Nonpeptide ligands for human gamma delta T cells. Proc. Natl. Acad. Sci. USA 91: 8175–8179.
. 2001. Identification of (E)-4-hydroxy-3-methyl-but-2-enyl pyrophosphate as a major activator for human gammadelta T cells in Escherichia coli. FEBS Lett. 509: 317–322.
. 2004. The interplay between classical and alternative isoprenoid biosynthesis controls gammadelta T cell bioactivity of Listeria monocytogenes. FEBS Lett. 561: 99–104.
. 2001. Human V gamma 2V delta 2 T cells produce IFN-gamma and TNF-alpha with an on/off/on cycling pattern in response to live bacterial products. J. Immunol. 167: 6195–6201.
. 2008. Definition of APC presentation of phosphoantigen (E)-4-hydroxy-3-methyl-but-2-enyl pyrophosphate to Vgamma2Vdelta 2 TCR. J. Immunol. 181: 4798–4806.
. 2002. Adaptive immune response of Vgamma2Vdelta2+ T cells during mycobacterial infections. Science 295: 2255–2258.
. 2007. Prolonged (E)-4-hydroxy-3-methyl-but-2-enyl pyrophosphate-driven antimicrobial and cytotoxic responses of pulmonary and systemic Vgamma2Vdelta2 T cells in macaques. J. Immunol. 179: 8287–8296.
. 2009. Expansion, reexpansion, and recall-like expansion of Vgamma2Vdelta2 T cells in smallpox vaccination and monkeypox virus infection. J. Virol. 83: 11959–11965.
. 2009. A rapid crosstalk of human gammadelta T cells and monocytes drives the acute inflammation in bacterial infections. PLoS Pathog. 5: e1000308.
. 1999. Human gamma delta T cells that inhibit the in vitro growth of the asexual blood stages of the Plasmodium falciparum parasite express cytolytic and proinflammatory molecules. Scand. J. Immunol. 50: 642–650.
. 2001. Granulysin-dependent killing of intracellular and extracellular Mycobacterium tuberculosis by Vgamma9/Vdelta2 T lymphocytes. J. Infect. Dis. 184: 1082–1085.
. 2007. Central memory Vgamma9Vdelta2 T lymphocytes primed and expanded by bacillus Calmette-Guérin-infected dendritic cells kill mycobacterial-infected monocytes. J. Immunol. 179: 3057–3064.
. 2009. Antigen-specific Vgamma2Vdelta2 T effector cells confer homeostatic protection against pneumonic plaque lesions. Proc. Natl. Acad. Sci. USA 106: 7553–7558.
. 1994. Neutrophils are essential for early anti-Listeria defense in the liver, but not in the spleen or peritoneal cavity, as revealed by a granulocyte-depleting monoclonal antibody. J. Exp. Med. 179: 259–268.
. 1996. Treatment with the antigranulocyte monoclonal antibody RB6-8C5 impairs resistance of mice to gastrointestinal infection with Listeria monocytogenes. Infect. Immun. 64: 3946–3949.
. 1993. Neutrophils are involved in acute, nonspecific resistance to Listeria monocytogenes in mice. Infect. Immun. 61: 5090–5096.
. 1995. Specific immunity to Listeria monocytogenes in the absence of IFN gamma. Immunity 3: 109–117.
. 2000. CD8+ T cell effector mechanisms in resistance to infection. Annu. Rev. Immunol. 18: 275–308.
. 2005. Relative contributions of NK and CD8 T cells to IFN-gamma mediated innate immune protection against Listeria monocytogenes. J. Immunol. 175: 1751–1757.
. 2008. IL-17A produced by gammadelta T cells plays a critical role in innate immunity against listeria monocytogenes infection in the liver. J. Immunol. 181: 3456–3463.
. 2009. IL-23 is required for protection against systemic infection with Listeria monocytogenes. J. Immunol. 183: 8026–8034.
. 1996. Control of natural killer cell-mediated innate resistance against the intracellular pathogen Listeria monocytogenes by gamma/delta T lymphocytes. Infect. Immun. 64: 1744–1749.
. 2008. gammadeltaT cell-mediated regulation of chemokine producing macrophages during Listeria monocytogenes infection-induced inflammation. J. Pathol. 216: 262–270.
. 2000. Depletion of a gamma delta T cell subset can increase host resistance to a bacterial infection. J. Immunol. 165: 6472–6479.
. 2011. Cell biology and immunology of Listeria monocytogenes infections: novel insights. Immunol. Rev. 240: 160–184.
. 2008. Selected prfA* mutations in recombinant attenuated Listeria monocytogenes strains augment expression of foreign immunogens and enhance vaccine-elicited humoral and cellular immune responses. Infect. Immun. 76: 3439–3450.
. 2003. Isolation of Listeria monocytogenes mutants with high-level in vitro expression of host cytosol-induced gene products. Mol. Microbiol. 48: 1537–1551.
. 2009. Gammadelta T cell immune manipulation during chronic phase of simian-human immunodeficiency virus infection [corrected] confers immunological benefits. J. Immunol. 183: 5407–5417.
. 2006. Tissue culture cell assays used to analyze Listeria monocytogenes. Curr. Protoc. Microbiol. Chapter 9: Unit 9B.4.
. 2011. Intranasal vaccination with the recombinant Listeria monocytogenes ΔactA prfA* mutant elicits robust systemic and pulmonary cellular responses and secretory mucosal IgA. Clin. Vaccine Immunol. 18: 640–646.
. 2006. Listeria monocytogenes traffics from maternal organs to the placenta and back. PLoS Pathog. 2: e66.
. 2010. Listeriosis: a resurgent foodborne infection. Clin. Microbiol. Infect. 16: 16–23.
. 2009. Plasticity of CD4+ T cell lineage differentiation. Immunity 30: 646–655.
. 2005. In vivo immunomanipulation of V gamma 9V delta 2 T cells with a synthetic phosphoantigen in a preclinical nonhuman primate model. J. Immunol. 175: 5471–5480.
. 2011. 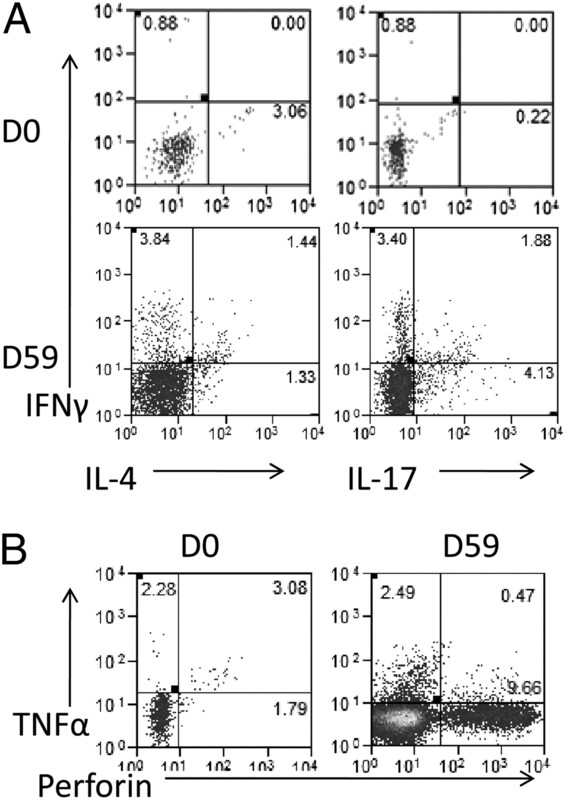 Differentiation, phenotype, and function of interleukin-17-producing human Vγ9Vδ2 T cells. Blood 118: 129–138.
. 2011. Virus infection stages and distinct Th1 or Th17/Th22 T-cell responses in malaria/SHIV coinfection correlate with different outcomes of disease. J. Infect. Dis. 204: 1450–1462.
. 2010. Differentiation, distribution and gammadelta T cell-driven regulation of IL-22-producing T cells in tuberculosis. PLoS Pathog. 6: e1000789.
. 2011. Membrane-bound IL-22 after de novo production in tuberculosis and anti-Mycobacterium tuberculosis effector function of IL-22+ CD4+ T cells. J. Immunol. 187: 190–199.
. 2000. Antigen recognition by human gamma delta T cells: pattern recognition by the adaptive immune system. Springer Semin. Immunopathol. 22: 191–217.
. 2003. Adaptive immune response of Vgamma2Vdelta2 T cells: a new paradigm. Trends Immunol. 24: 213–219.
. 2003. Differentiation of effector/memory Vdelta2 T cells and migratory routes in lymph nodes or inflammatory sites. J. Exp. Med. 198: 391–397.
. 2008. Long-term expansion of effector/memory Vdelta2-gammadelta T cells is a specific blood signature of CMV infection. Blood 112: 1317–1324.
. 2006. Anti-severe acute respiratory syndrome coronavirus immune responses: the role played by V gamma 9V delta 2 T cells. J. Infect. Dis. 193: 1244–1249.
. 2005. Flow-cytometric detection of vaccinia-induced memory effector CD4(+), CD8(+), and gamma delta TCR(+) T cells capable of antigen-specific expansion and effector functions. J. Infect. Dis. 192: 1362–1371.
. 1998. Bacille Calmette-Guérin vaccination enhances human gamma delta T cell responsiveness to mycobacteria suggestive of a memory-like phenotype. J. Immunol. 161: 1045–1054.
. 2008. Immune distribution and localization of phosphoantigen-specific Vgamma2Vdelta2 T cells in lymphoid and nonlymphoid tissues in Mycobacterium tuberculosis infection. Infect. Immun. 76: 426–436.
. 2011. Interferon-gamma negatively regulates Th17-mediated immunopathology during mouse hepatitis virus infection. J. Mol. Med. 89: 399–409.
. 2010. Interferons direct Th2 cell reprogramming to generate a stable GATA-3(+)T-bet(+) cell subset with combined Th2 and Th1 cell functions. Immunity 32: 116–128.
. 2003. Protection of interferon-gamma knockout mice against Listeria monocytogenes challenge following intramuscular immunization with DNA vaccines encoding listeriolysin O. Vaccine 21: 2122–2132.
. 2003. Deficient anti-listerial immunity in the absence of perforin can be restored by increasing memory CD8+ T cell numbers. J. Immunol. 171: 4254–4262.
. 2000. Vgamma9/Vdelta2 T lymphocytes reduce the viability of intracellular Mycobacterium tuberculosis. Eur. J. Immunol. 30: 1512–1519.